As global media starts preparing for the Cannes Film Festival 2019, we cannot but launch the new season without a look back at one of the most influential businesswomen and whose brand happens to be the official partner of the most famous festival. Last May, we sat down with the very charming Ms. Scheufele. Caroline Scheufele, a name that has become synonymous with the iconic Swiss jewelry house of Chopard, had so much to tell us about her career, her brand and her business strategy. AM: How are you able to maintain the legacy of Chopard while modernizing it at the same time? We are an almost 160-year-old maison and we are one of the very few 100% family owned companies. So naturally, we pay a lot of attention to tradition and passing the know-how of the craftsmanship, the engraving and watchmaking. Everything is made in house, but at the same time we try to be edgy and upfront. We use a lot of titanium in high jewelry and ceramics, and we keep on adding novel materials and styles to classical collections. I think new generations pay more attention to sustainability and that is why we are determined on using ethical gold only. AM: A lot of fashion and jewelry houses are closing down while Chopard is always on the rise. What is your secret recipe? It all starts with the product, new designs and impeccable quality. Our brand stands for real luxury, and if you have a piece of fine jewelry it should always bring you happiness and joy. Our after sales service is also key in our business model. AM: How do you choose your celebrity brand ambassadors? We allow celebrities to select what they want to wear according to their own style and preferences. That is why they often fit the piece because it doesn’t feel imposed. Over the years, we have developed many friends who trust us from the movie and music métier and who contact us prior to their red carpet appearances. How important is the Cannes Film Festival for the Chopard universe? It is a long partnership. We consider it a form of love story with the Cannes Film Festival; it’s beyond a commercial alliance. For instance, we established the Chopard Trophy, which is awarded to young talents to give them the chance to succeed in the industry. We have a lot of projects with the festival and this is what makes our relationship so special. AM: What do you think of Middle Eastern women? I think they take much more care of themselves than European women do. When I travel around the Middle East I am always amazed by how perfect their hair and makeup is. I find this very nice. AM: You are a woman boss. What is your message to women in the professional sector? You should always speak your mind. Women have so much to give across different industries be it politics, humanitarian, arts, etc. We are not only nice to look at, we have a lot to say, and that doesn’t make us less feminine. AM: Finally, what is your next chapter? My mission is to go as far as I can with the certifications of gold and gemstone mines, and it is a very long journey. I am talking with banks and forums to spread the word on a global spectrum. Pictured above with Maison de Mode’s founders Hassan Pierre and Amanda Hearst, Caroline Scheufele received the Designer of the Year award at the second annual Sustainable Style Gala on February 23, 2019 in Los Angeles. The award is a recognition of the pioneering work that Chopard has achieved with The Journey to Sustainable Luxury since 2013 with a groundbreaking announcement last year that the Maison achieved an 100% ethical gold supply chain. Happy Hearts pendant (left): 18-carat ethical rose gold pendant composed of a heart fitted with a dancing diamond and mother-of-pearl. 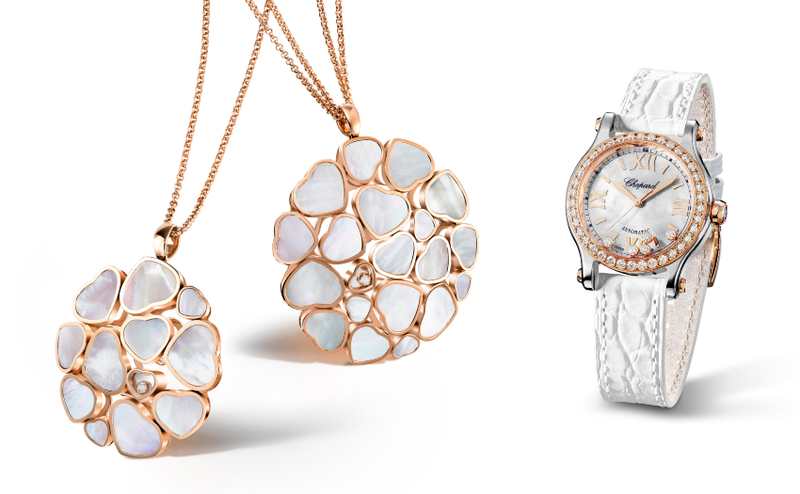 Happy Sport watch (right): Stainless steel 18-carat ethical rose gold, with gemset bezel and white textured mother-of-pearl dial. Five dancing diamonds and matt white alligator leather strap.